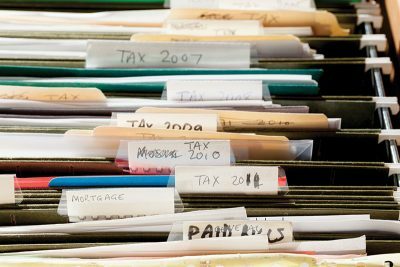 One of the most frequently asked questions that we get from clients is “ How long do I have to keep all of my records and tax returns?”. The general rule for copies of tax returns is – indefinitely. With the advent of scanning and electronic storage programs, this is slightly less onerous than in previous years. Documentation related to income and deductions that are reported on these tax returns should generally be kept for 7 years. Generally, the Internal Revenue Service is able to audit tax returns within three years of the date that the return was filed. However, an extra two years may be added to this if the IRS can establish that there was a significant understatement of income in the tax return being audited. In California, the Franchise Tax Board gets an extra year over the IRS time period to audit tax returns from the date those returns were filed. These records would not only include W-2’s, 1099’s, 1098’s, receipts for charitable deductions and business expense receipts, but also bank statements and paycheck stubs as proof of income. So keep any records that support the income or deductions that you report on your return for 7 years. Records related to the purchase of assets, such as stocks, bonds, real estate and partnership investments should be kept for at least 7 years after the asset is sold and reported on a tax return. For your personal residence, you should keep the initial purchase escrow statement and records of any improvements that you made to the property, such as a new kitchen, new pool, adding an extension or landscaping. These amounts are deductible in calculating any gain that you may realize on the sale of your personal residence, so it is important to have these records available when it comes time to sell your home. Keeping records that are not related to your taxable income or deductions is more of a judgement or comfort/space decision. With the increasing use of on-line banking services and bill paying, this is becoming less of an issue. It would seem prudent that deposit slips and charge receipts should be kept long enough to be able to confirm the deposits on your bank statements and the charges on charge card bills.